I grew up in a million-man terrarium called Houston, where Texas-size mosquitos dazzled with their fertility and spitefulness. The mosquito truck on summer evenings coursed slowly through our neighborhood, belching its sweet white cloud of mosquito-killer from its back end. I do not doubt that the chemists who developed the spray and the municipal officials who procured it had anything but the best intentions, but in my experience the cloud served only to enliven the insects and inspire them to ramp up their evildoing. Southern Mississippi shares Houston’s climate, and although the mosquitos of the Deep South run smaller than their Texas kin, they hold their own in sheer numbers. It could be that there are more mosquitos per capita in Mississippi than in Texas, but one condition shared by mosquitos worldwide is their love of me and my bodily juices. My blood is nectar to mosquitos, and for much of my life, especially the periods of prolonged indolence, swatting them has been my only source of cardiovascular activity. You could power a few houses or a fast-food restaurant if you could harness the energy expended by my waving-away of mosquitos. Monday evening, Calvin and I were sitting on the back patio around dusk. The sky hadn’t turned gray, and a few delicate white clouds gauzed across the pretty blue. I sat in something called a Balinese lazy chair, the back of which extends farther than the backs of most chairs. The back of my lazy chair runs about 45 degrees from plumb, leaving its occupant few options except lazing and looking upward, which I suppose is the point. You could read a book in my lazy chair but only for brief stretches since your arm would get tired, the reason being that if you were to rest your elbow on the arm of the chair in the way people tend to when reading books in chairs, the book would rest down near your belt buckle, rendering it unreadable when your head is positioned more as if you were an astronaut at takeoff. Thus situated in my lazy chair Monday and facing the heavens, I could not help but become aware of a dragonfly flitting about. It zoomed across the clearing of our backyard, pausing after each pass to catch its breath and prepare for the return trip. Zoom – pause – zoom – pause – zoom some more. Then there were two dragonflies, and then three and then another. We see bats now and then at dusk, which I never mind because bats eat mosquitos by the bushel. I have never felt the impulse to eat a mosquito, but anything that results in their death is fine by me. I hope that when a mosquito enters a bat’s mouth and gullet, it retains consciousness long enough to feel both pain and remorse, but especially pain. I hope the insides of bats’ mouths and gullets are coarse like sandpaper and peel away the mosquito’s skin, or whatever body covering mosquitoes have, as it travels, still alive, toward the bat’s stomach. If you have ever skinned your knee or scraped a knuckle, you know how painful it can be to have skin removed abruptly. I hope the mosquito feels that over his entire little body before he dies. The dragonflies last night behaved much as the bats do, and their flitting and zooming made me wonder what dragonflies eat. A quick internet search revealed words — from Mother Nature Network — as beautiful as any I had ever read. Dragonflies are flat out terrifying if you’re a gnat, mosquito or other small bug. They don’t simply chase down their prey. Instead, they snag them from the air with calculated aerial ambushes. Dragonflies can judge the speed and trajectory of a prey target and adjust their flight to intercept prey. They’re so skilled that they have up to a 95 percent success rate when hunting. 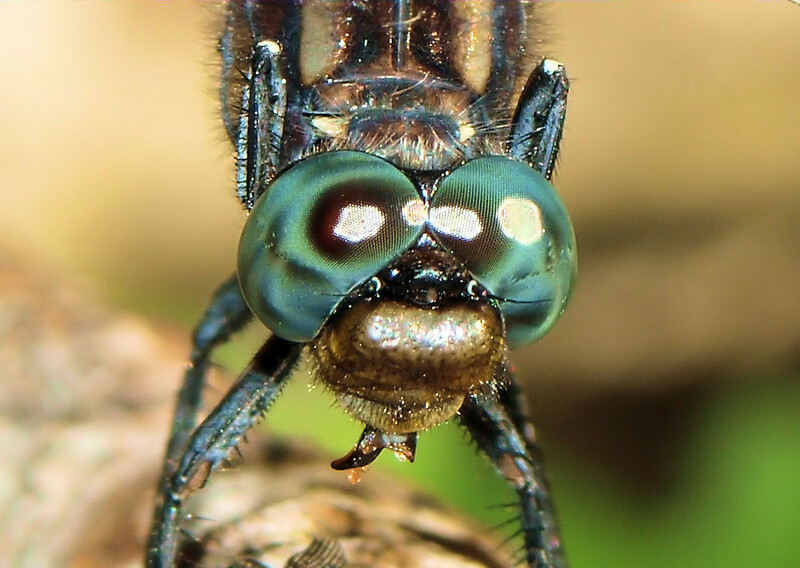 Dragonflies have incredibly sharp mandibles. I do not need to have a picture drawn for me to understand the relevance of sharp mandibles to an insect’s ability to kill and eat other insects. On the other hand, I would not turn down the gift of a photograph, painting or detailed drawing of a dragonfly clutching or munching on a mosquito. I would frame it and hang it in a place where I could view it often. I would also make a miniature copy and laminate it so I could carry it in my wallet. I would like being able to look at a dead, or dying, mosquito, especially one in its painful death throes. I also learned from my research that dragonflies of one species migrate over 11,000 miles in their lifetime. In other circumstances I might have spent time marveling at a bug’s migratory endurance, but I was far more interested here in their ability as mosquito dispatchers. One thing I already knew about dragonflies before commencing my research was that they belong to the Order Odonata. I knew this from my days tying trout flies. To tie trout flies you have to know a thing or two about insect taxonomy, at least if you want your flies to look like actual insects and not like little bitty hats.